ابراهیمی, حجت, گندمکار, امیر, المدرسی, سید علی, رامشت, محمد حسین. (1395). برآورد دمای سطح زمین و تأثیر پوشش گیاهی بر دمای سطح با استفاده از تصاویر مودیس (مطالعه موردی: حوزه تویسرکان). فصلنامه جغرافیا ( برنامه ریزی منطقه ای), 24(1), 23-32. حجت ابراهیمی; امیر گندمکار; سید علی المدرسی; محمد حسین رامشت. "برآورد دمای سطح زمین و تأثیر پوشش گیاهی بر دمای سطح با استفاده از تصاویر مودیس (مطالعه موردی: حوزه تویسرکان)". فصلنامه جغرافیا ( برنامه ریزی منطقه ای), 24, 1, 1395, 23-32. ابراهیمی, حجت, گندمکار, امیر, المدرسی, سید علی, رامشت, محمد حسین. (1395). 'برآورد دمای سطح زمین و تأثیر پوشش گیاهی بر دمای سطح با استفاده از تصاویر مودیس (مطالعه موردی: حوزه تویسرکان)', فصلنامه جغرافیا ( برنامه ریزی منطقه ای), 24(1), pp. 23-32. ابراهیمی, حجت, گندمکار, امیر, المدرسی, سید علی, رامشت, محمد حسین. برآورد دمای سطح زمین و تأثیر پوشش گیاهی بر دمای سطح با استفاده از تصاویر مودیس (مطالعه موردی: حوزه تویسرکان). فصلنامه جغرافیا ( برنامه ریزی منطقه ای), 1395; 24(1): 23-32. بررسی عوارض زمینی اعم از پوشش گیاهی، منابع آبی، انواع کاربری‌ها و ازجمله جنس و بافت خاک منطقه ازجمله مواردی است که نیاز به داده‌هایی با دقت بالا دارد. دقت بالا و کیفیت داده‌ها می‌تواند ما را به نتایج دقیق‌تر بهتر برساند. در این راستا داده‌های دورسنجی ابزار بسیار مناسبی برای تشخیص و تعیین الگوها محسوب می‌گردد. الگوریتم توازن انرژی سطح زمین سبال الگوریتم نسبتاً جدیدی است که در اکثر نقاط دنیا برای برآورد تبخیر و تعرق و سایر شارهای گرمایی و همچنین دمای سطح مورد استفاده قرار گرفته و نتایج رضایت‌بخشی داشته است. به‌منظور برآورد دمای سطح در منطقه تویسرکان از توابع استان همدان با استفاده از الگوریتم سبال داده‌های سنجنده مودیس استفاده گردید. هدف اصلی در این تحقیق بررسی دقت روش دورسنجی در برآورد دمای سطح و معرفی مناسب‌ترین روش می‌باشد. بالاترین دما در منطقه 315 درجه کلوین و حداقل دما 287 درجه کلوین می‌باشد. ارتفاعات با توجه به داشتن گرادیان دما حداقل میزان دمایی را برخوردار هست. مناطقی که دارای پوشش گیاهی می‌باشد دمای متعادل‌تری در منطقه دارد. Study of Terrain Including vegetation, water resources, land types Including soil texture and classification are cases that require data with high precision. Accurate and high quality data can lead us to a better, more accurate results.In this context, remote sensing data is a great tool for the detection and identification of patterns. SEBAL (surface energy balance algorithm) is a relatively new algorithm for estimating evapotranspiration in most parts of the world and other heat fluxes and land surface temperatures used and the results have been satisfactory. To estimate the surface temperature in the Tuyserkan district using data SEBAL algorithm, bands of MODIS images were used. The main objective of this study was to evaluate the accuracy of remote sensing methods to estimate the surface temperature and the best method is introduced. The highest temperature in the region of 315 ° K and the minimum temperature is 287 degrees Kelvin. Heights with respect to a given temperature are the minimum temperature gradient. Areas of vegetation are more moderate temperatures in the region. Ahmad, M.D., Biggs, T., Turral, H., Scott, C.A., 2006. Application of SEBAL approach and MODIS time-series to map vegetation water use patterns in the data scarce Krishna river basin of India, Journal of Water Science & Technology, 53 (10): 83–90. Bastiaanssen, W.G.M., Menenti, M., Feddes, R.A. and Holtslag, A.A.M.,1998. Aremote sensing surface energy balance algorithm for land (SEBAL), part 1:Formulation, Journal of Hydrology, 212–213, pp. 198–212. Bastiaanssen, W. G. M., Noordman, E. J. M., Pelgrum, H., Davids, G., Thoreson, B.P., Allen, R. G., 2005. SEBAL Model with Remotely Sensed Data to Improve Water-Resources Management under Actual Field Conditions, Journal of irrigation and drainage engineering,131 (1): 85-93. Herb, W. R., Janke, B., Mohseni, O., Stefan, H. G., 2008. Ground surfacetemperature simulation for different land covers, Journal of Hydrology, 356, pp.327– 343. Leng, P.; Song, X.; Li, Z.-L.; Wang, Y. Evaluation of the Effects of Soil Layer Classification in the Common Land Model on Modeled Surface Variables and the Associated Land Surface Soil Moisture Retrieval Model. Remote Sens. 2013, 5, 5514-5529. Mesdaghi M., 1993. 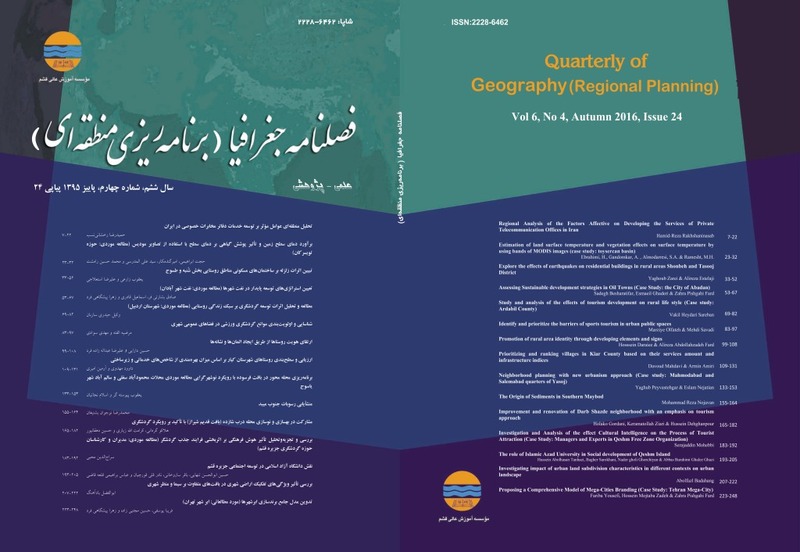 Management of Iranian’s Rangelands, Astan_e_Ghods publications, 218 pp. Sohrabinia, M.; Rack, W.; Zawar-Reza, P. Analysis of MODIS LST Compared with WRF Model and in situ Data over the Waimakariri River Basin, Canterbury, New Zealand. Remote Sens. 2012, 4, 3501-3527. Soliman, A.; Duguay, C.; Saunders, W.; Hachem, S. Pan-Arctic Land Surface Temperature from MODIS and AATSR: Product Development and Intercomparison. Remote Sens. 2012, 4, 3833-3856. Tasumi M., Trezza, R., Allen, R.G. and Wright, J.L., 2003. U.S. Validation tests on the SEBAL model for evapotranspiration via satellite. ICID Workshop on Remote Sensing of ET for Large Regions, Montpellier, France, 17 Sept. 2003. Urban, M.; Eberle, J.; Hüttich, C.; Schmullius, C.; Herold, M. Comparison of Satellite-Derived Land Surface Temperature and Air Temperature from Meteorological Stations on the Pan-Arctic Scale. Remote Sens. 2013, 5, 2348-2367. Wang, J., R. Kimura and W. Bastiaanssen. 2005. “Monitoring ET with remote sensing and the management of water resources on a basin scale”. The 11th CEReS International Symposium on Remote Sensing Japan. Zhou, J.; Zhang, X.; Zhan, W.; Zhang, H. Land Surface Temperature Retrieval from MODIS Data by Integrating Regression Models and the Genetic Algorithm in an Arid Region. Remote Sens. 2014, 6, 5344-5367.